* Metal vane pobe, heavy duty, wide range measurement. * 3 air flow mode: instant, 2/3 V.max, Average. * Low-friction ball vane wheels make sure high accuracy in high & low velocities. * Record maximum and minimum reading with recall. * Microcomputer circuit provides special function & offer high accuracy. * Build-in low battery indicator. * Operates with 006P DC 9V battery. * RS232 PC serial interface. * Separate probe, easy for operation of different measurement environment. * Wide applications: use this anemometer to check air conditioning & heating systems, measure air velocities, wind temperature...etc. Air Velocity Range : 0.4 - 25.0 m/s, 1.4 - 90.0 km/h, 0.9 - 55.9 mile/h, 0.8 - 48.8 knots, 80 - 4930 ft/min. Air Velocity Resolution : 0.1 m/s, 0.1 km/h, 0.1 mile/h, 0.1 knots, 1 ft/min. Air Flow Range : CMM : 0 - 999,900 m^3/min,CFM : 0 - 999,900 m^3/min. Operating Environment : 0℃ to 50℃( 32℉to 122℉). 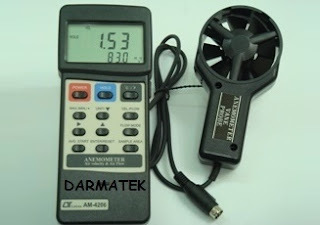 Applications : use this anemometer to check air conditioning & heating systems, measure air velocities, wind speeds, temperature, Air velocity : m/s, ft/min, km/h, knots, Separate probe, easy for operation of the different measurement environment. 3 air flow mode : Instant, 2/3 Vmax, Average.